The Hammer Museum is pleased to welcome the return of four highly respected Tibetan Buddhist monks—Venerable Gelong Kalsang Rinpoche, Venerable Lama Nawang Thogmed, Lama Nawang Samten Lhundrup, and Lama Dorji Sherpa—to create an elaborate sand mandala in the Lobby Gallery. This two-week program, presented in partnership with Ari Bhöd, the American Foundation for Tibetan Cultural Preservation, features the construction of a sacred sand painting embodying compassion. Millions of grains of colored sand will be sprinkled carefully on a flat surface over the course of two weeks, following precise and ancient instructions passed down over thousands of years. This is the third time the Hammer has collaborated with Ari Bhöd to bring traditionally trained Lamas to the museum. 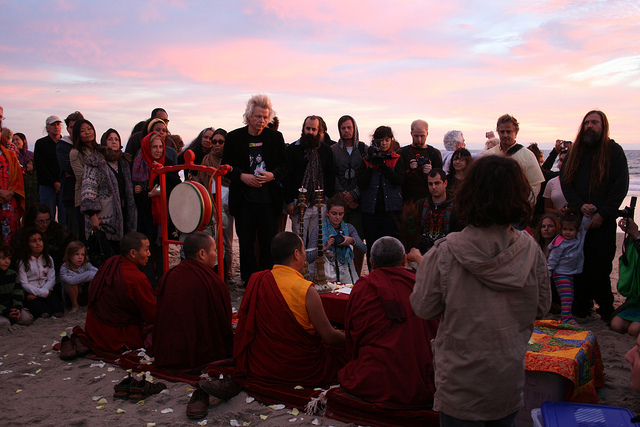 In the first presentation, The Mandala Project in 2010, the Lamas broke attendance records for the Lobby Gallery when they a created a mandala representing Guru Padmasambhava, the master who brought Buddhism to Tibet. 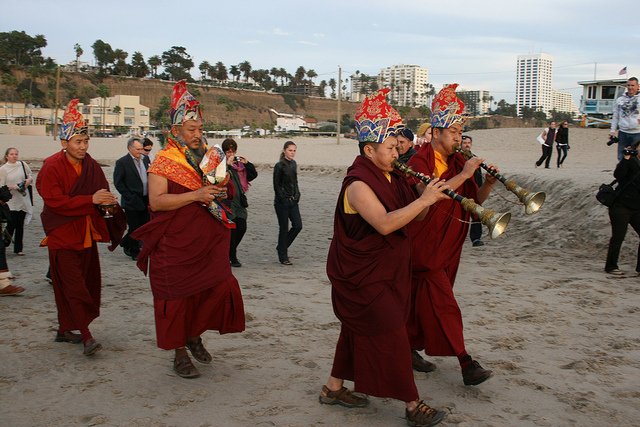 The Lamas returned in 2012 to perform a healing ceremony in the Billy Wilder Theater. The mandala that the Lamas will make this fall represents Chenrezig, the embodiment of the compassion of all Buddhas combined. The creation of this mandala is intended to help the viewer generate boundless compassion for all beings. 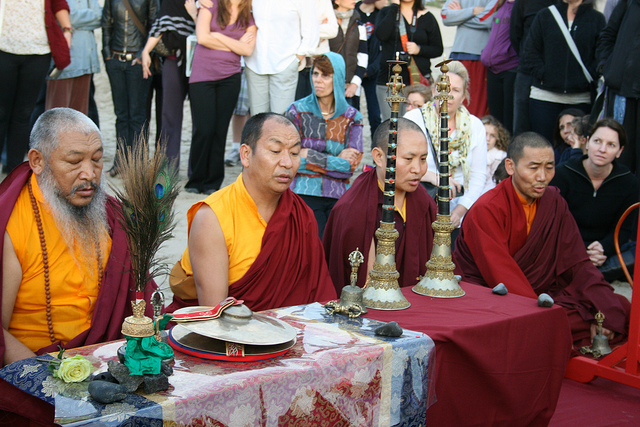 Visitors to the Hammer can watch the Lamas create the Mandala and are invited to join the Lamas in pujas at the beginning and end of each day. The pujas include prayer and meditation intended to help bring to mind the qualities of the Buddha of Compassion. After spending two weeks creating the mandala with intense concentration, the final grains of sand are placed and then the entire sand painting is swept up in a final display of impermanence. 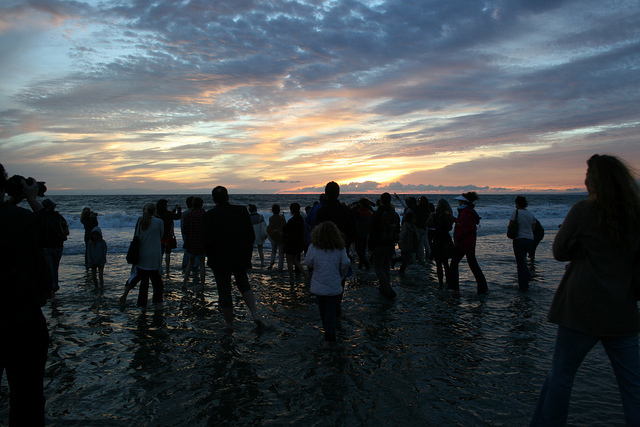 The Lamas and the visitors bring the collected sand to the ocean and offer it as a blessing as part of the dissolution ceremony. The mandala is a profound, universal symbol that translates literally to “center and its surroundings” and is a physical representation of our interdependence with the world around us. Mandalas are found in many forms, but always include a circle, a central point, and some form of symmetry. They can be created in sand, on paper or cloth, or built as 3-dimensional models or buildings. 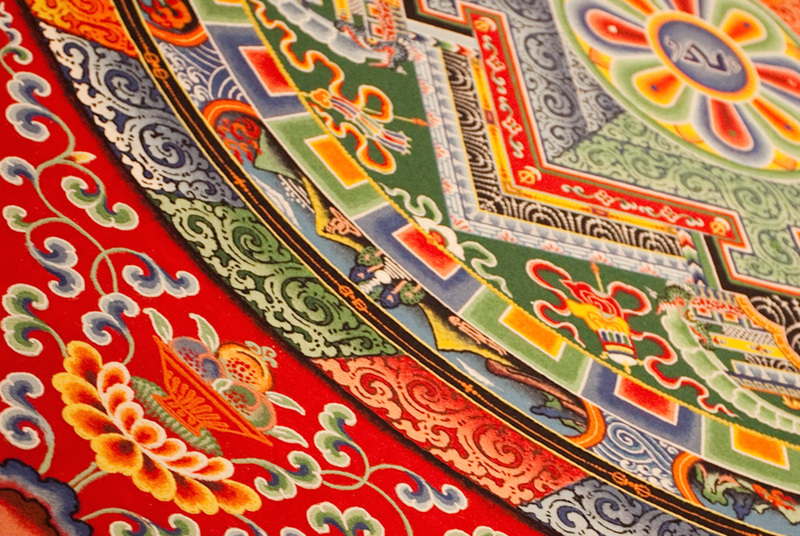 The vivid painted mandalas of Tibet are the most widely known. Traditionally created as a tool for visualization and meditation, every single detail of a mandala—the design, the colors, and placement of symbols—is deliberate. The blueprints are considered sacred, with many layers of deep meaning and positive representation. Before beginning, traditional mandala artists generate the intention to benefit others and the motivation of compassion, which is believed to infuse the art or structure with unique spiritual and sacred qualities. Organized by Allison Agsten, curator of public engagement, with January Parkos Arnall, curatorial assistant, public engagement. 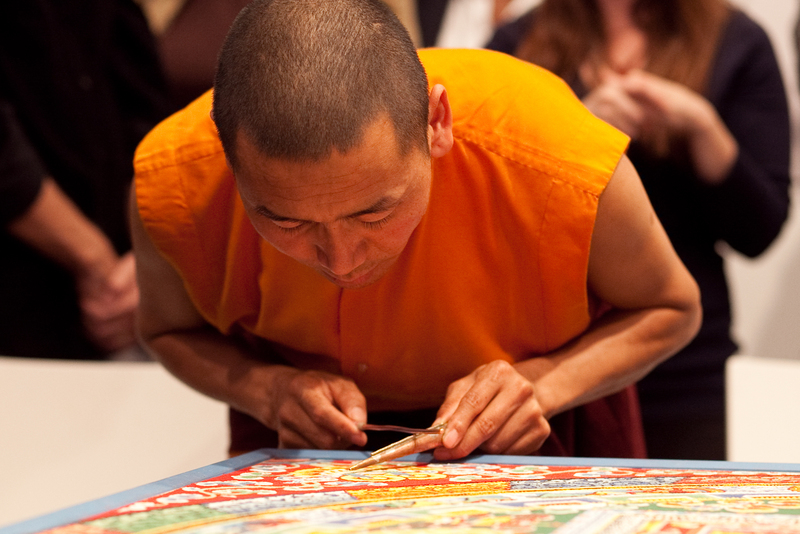 The public is invited to watch the Lamas create the mandala during the museum hours. Please note: While the mandala will be on view during museum hours, the Lamas take occasional breaks during the day including an extended lunch break from approximately 1-2PM. In addition, every day will begin and end with puja (meditation and prayer) lasting approximately 45 minutes, the public is welcome to participate in puja but the lamas will not be working on the mandala during this time. Venerable Gelong Kalsang Rinpoche is the former Vajra Master of Rigdzin Drub-Pai Ghatsal, His Holiness Chatral Rinpoche’s seat in Pharping, Nepal. Ven. Gelong Kalsang Rinpoche is a fully ordained Bikshu monk and Lama of the Nyingma lineage. Ordained as a monk at the age of 11, Rinpoche studied with and has received empowerments and teachings from the foremost lamas of the Nyingma lineage of this era. Ven. Gelong Kalsang Rinpoche currently serves as Abbot and Spiritual Director at Kunkhap Yoesal Thonkdol Choeling in Nepal as well as the Taiwan Nyingmapa Padmasabhava Pureland Buddhist Association in Taiwan, where Rinpoche oversees activities, teaches and serves as spiritual advisor his students. Venerable Lama Nawang Thogmed served as the personal artist for His Holiness Trulshik Rinpoche for many years. He has planned, painted and directed the completion of traditional temple art and design for numerous monasteries and temples throughout Nepal. Renowned in the Tibetan monastic community in exile for the integrity of his work and strict adherence to the ancient traditions of “old Tibet”, Ven. Lama Thogme is a master of ritual arts, and is often sought out to train many of the monks of the Nyingma and Kagyu lineages throughout India and Nepal. Lama Thogmed’s specialty is in the complex art of mandala-making, specifically that of the sand mandala. Venerable Lama Thogmed is an accomplished practitioner and a fully ordained monk (Bikshu). Lama Lhundrup received his formal Buddhist training and instruction from numerous lamas, including His Holiness Trulshik Rinpoche and Venerable Lobsang Rinpoche of Norbu Linka Monastery. By the time he was a teenager, he had already completed his extensive training in the instruction on Tibetan Arts of Dharma Building and Housing for the Practice of Dharma. A master carver and craftsman, many of Lama Lhundrup’s unique skills have been extensively employed at Ari Bhöd’s retreat land Pema Drawa, where he has completed all of the hand-carving and intricate woodwork of the traditional Tibetan shrine and temple. Lama Dorji is an ordained Buddhist monk who has completed training and instruction since the age of thirteen with Gelong Kalsang Rinpoche. 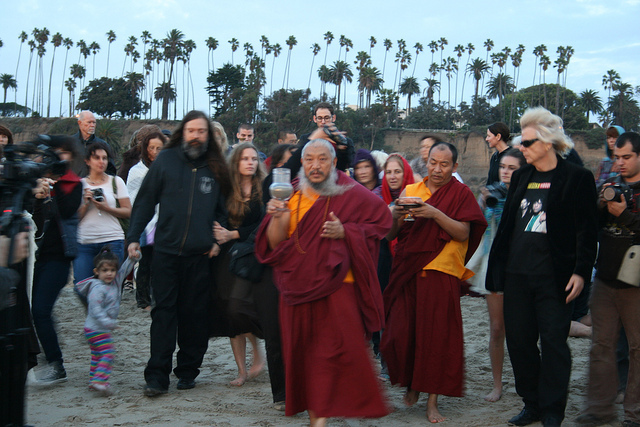 He has wide experience with many facets of Tibetan Ritual Arts and is fluent in numerous languages. He has traveled from Gelong Kalsang Rinpoche’s monastery in Nepal to serve as assistant mandala artist. Part of the curatorial department, the Public Engagement program collaborates with artists to develop and present works that create an exchange with the institution and with visitors. 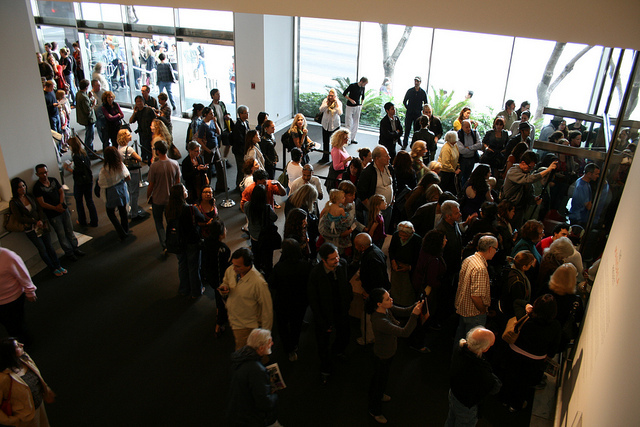 Enacted both inside and outside the galleries, Public Engagement projects range from re-envisioned security guard uniforms to library and orchestra residencies. 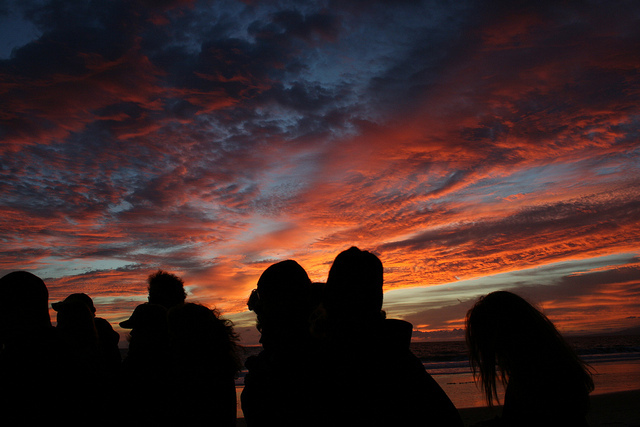 Public Engagement programs are supported, in part, by the Los Angeles County Board of Supervisors through the Los Angeles County Arts Commission. Mandala of Compassion is supported by Catherine Glynn Benkaim and Barbara Timmer.